austerity of a winter afternoon. I was really excited to be off at three this afternoon because lately it's dark by four thirty, so I can never get good pictures of my projects! The past couple of days the boys and I have been gathering twigs and leaves and I've been making them into wreaths! Just finished them this evening. 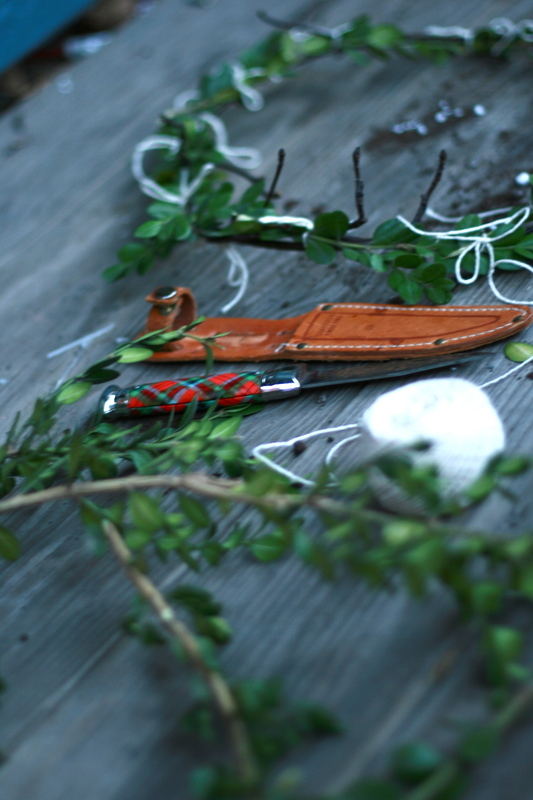 The tools: badass Sheffield knife, a ball of string, nice long bendy twigs and a few handfuls of pretty foliage. Turns out there's a box hedge right in front of our apartment that I'd never noticed before. A few days ago I was riding my bike home bemoaning the fact that there are hardly any evergreen trees here except well manicured ones in the rare yard (which in turn made me miss my Evergreen State) then bam! there was the box hedge! I think it looks really pretty, and it reminds me of England for some reason, also it looks kind of like Mistletoe. Speaking of which, I need to go to my plant shop, they said the mistletoe would be in this week! There are now four wreaths hanging one in each of our street facing windows! I have to run down and see the view from the street! Hope you are having a lovely winter afternoon too!